If you’ve never watched an episode of The Lucas Bros. Moving Co., the animated Fox comedy from identical twin brothers Keith and Kenny Lucas, you probably know them also as the scene-stealing twins from 2014’s 22 Jump Street. Now the 31-year-old nerds have a new Netflix special, Lucas Brothers: On Drugs, and are working on a second. Their jokes range from riffs on feminism and Jermaine Jackson to Steph Curry and the rise of advanced analytics. There’s a very funny breakdown, complete with pie chart, of the factors that contribute to black happiness. The majority of the pie chart is taken up by “white suffering,” and there are jokes about O.J. Simpson, race and fame thrown in for good measure. The Lucas brothers dropped out of law school to become comedians — Keith from Duke, Kenny from NYU — and their strongest material focuses on the drug war and its effects, complete with cutouts of Richard Nixon flanking the stage as a life-size boogeyman. Though the special isn’t strictly political, the brothers rock campaign buttons for Kerry/Edwards and Barry Goldwater (more on that in the interview). As with Moving Co., much of the Lucases’ humor is weed-based (they’re reformed sativa connoisseurs; now their preference is indica). It’s sharp, smart, insightful and hilarious. For fans of the Lucas brothers’ animation, the special includes a trippy short that examines a world in which the drug war never took place. The brothers are currently developing a new animated project, and they’re also working on a show imagining a wizarding school that’s also an HBCU. 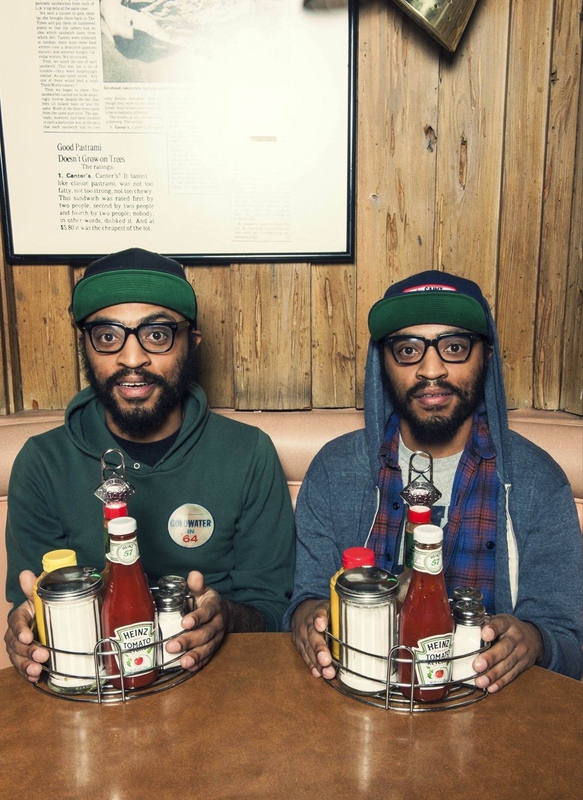 The Lucas Brothers: On Drugs debuts April 18 on Netflix. I’d recommend watching the special before reading this interview, but it’s not entirely necessary. What do you find so appealing about animation? It’s one of your trademarks at this point. Kenny: I love animation for a number of reasons. One, it’s a very open form, so you can pretty much go wherever you allow your mind to take you, which I think is an asset when you’re trying to do comedy. The second thing is I love color. I love visuals. I love art. And I always have these vivid patterns in my mind whenever I go to sleep or if I smoke weed, and I feel like with animation you can get that out much easier. Stand-up is hard. There are some comedians who are very gifted verbally. They can paint a picture very well. I think Lil Rel [Howery] is a good example. Richard Pryor, those guys. But with us, I think our biggest asset is our mind, and with animation you can just get so much out there. Keith: It always brings me back to my childhood when we’re able to dabble in animation. It’s just a vivid reminder of what childhood was like. Animation is playful, too. You can talk about serious issues, but when it’s in the guise of animation, it seems more playful. People seem to keep their ears and eyes open when animation’s on screen, irrespective of what that message is. Kenny: I loved Winnie the Pooh. Kenny: Pinky and the Brain. Keith: King of the Hill. I was wondering what you guys have learned about yourselves as a result of smoking weed? Keith: I just don’t take myself as seriously. Before I smoked weed, I guess I worried a lot. I had a lot of anxiety. I used to just be afraid of the future and afraid of death and things like that, but as I started smoking more weed I’ve just been taking things a lot easier. I don’t know if it’s because of weed or because I’ve gotten older, but the two have coalesced together to minimize my fear about the future. Kenny: Same. When you smoke you have an out-of-body experience where you feel like you’re traveling the universe and you sort of detach yourself from your body, from your ego, and I feel like [by] smoking weed in conjunction with therapy and meditation, you move away from your ego. That’s been a big thing for me. I’m so appreciative of weed. I’d imagine distancing yourself from your ego is important for you guys since you work as a pair. Keith: Absolutely. That was an early struggle. Even though we’re twins and we look exactly alike and we had a similar experience, we’re still individuals, and we held on to what we thought was the particular way to do comedy or to live life. As we got into comedy more and worked a little bit more, we started to realize that in order for this to function as a unit, we have to shed the ego. Kenny: I think you can appreciate the distinctness and uniqueness of a person’s individual character and not necessarily be egocentric. Speaking of weed’s anti-anxiety properties, have you found yourselves smoking more since the election? Kenny: You know what? Absolutely. I would be lying if I said I hadn’t. It’s been a huge increase in how much weed I smoke, and I think it’s because 2016 was — even before the election — 2016 was exhausting. It was the most exhausting year I’ve ever had just because of the constant news coverage of Trump and the election. And then you’re like, Alright, it’s over. We elected a president. And then you’re like, Aw f—, Trump is president so it’s going to be even worse now. The only way I’m going to get through the next four years is if I’m stoned outta my f—ing mind. I have to literally detach myself because there’s no other way, really. I’ve looked at everything. If you’re not going to physically leave the country, you have to mentally and spiritually check out. You can protest, but come on. Keith: You can’t protest for four years. That gets exhausting and you realize, what can we realistically do? You start to feel so small, like the universe is so much bigger than any individual and it doesn’t matter if we protest till we’re blue in the face. He has the capabilities and the power to do whatever he pleases. Aside from the strangeness of doing ‘shrooms with someone who looks exactly like you, what else was that like? Kenny: Awful. That was the worst. It was not a magic experience. Keith: You go into thinking it’s going to be the dopest, like O sh—, we’re gonna be on like the sixth, seventh dimension, and you literally just start questioning everything. Like every little thought or belief you ever had, you start questioning it. And then you see your brother going through the same thing, so it’s literally like you’re watching yourself freak out. It’s out of body. If it’s not cool and flowery like the ’60s, then it’s just trippy and scary like a horror movie. It was too intense. Kenny: I did look at this Woody Allen picture for, like, 40 minutes and he was wearing a dope shirt, so that’s good. Kenny: The power of positivity. Is there anything professional that you would consider doing individually, where you don’t come as a pair? Kenny: President of the United States. I’d definitely take that. If I was asked to host — no. (To Keith) Anything I do, I’d want to do with you. Keith: Yeah. I don’t think there’s anything I would want to do if it didn’t involve him. Kenny: Oh! Batman. If they asked me to be Batman I’d do it. Keith: Oh yeah. If you were playing Batman, that’d make sense. Keith: I would ask if I could play Robin though. Kenny: Oh, yeah, yeah, yeah. I’d put in a strong request for you to play Robin. What was with the Kerry/Edwards and the Goldwater buttons? Kenny: I think what we were trying to say, is that the political parties are not really that different. Especially when it comes to the war on drugs, because Nixon started it. Carter did nothing to stop it. Reagan expanded it. Clinton expanded it. The Bushes, of course, were big fans of the drug war. Obama — it did so much damage by the time it got to Obama there was very little he could do, and I’m sure with Trump and [Attorney General Jeff] Sessions, they’re going to ratchet it up, so it’s like the Democrats and the Republicans are both complicit in the failed policy. You have firsthand experience with the effects the prison-industrial complex can have on a family. When you see the things that Jeff Sessions says about going after places where weed has been legalized, does that worry you? Keith: Being a child of a prisoner and being directly impacted, you have a sense of fear. With Trump and Sessions, it seems like they’re taking everything to the next level. Kenny: Yeah. The mythology that surrounds marijuana, you have to break through it. Keith: People forget there are real-world implications from locking up a person. Families are destroyed. Communities are ravaged. We’ve lost a generation of African-American men who could have done great things. Our dad was very smart. He had all the talents in the world. He made some bad choices. His whole life was destroyed because of that. Kenny: You’re not seeing people. You’re seeing statistics. You’re not delving into the particular story of a person. On a little bit of a lighter note, Keith, I read that you went to Duke. How do you feel about this year’s NCAA national champions? Keith: You know, it’s an ebb and flow. Duke wins one year. UNC wins the next. I think it’s good for Tobacco Road. You can’t tell the story of Duke without UNC. You can’t tell the story of UNC without Duke. I like to see it as a symbiotic story of two programs that push each other to great heights. But that’s just the standardized, PC version of what I need to say. I was going to say, that’s mighty gracious of you. Keith: F— Roy Williams. I hate UNC. They’re a bunch of f—in’ cheaters. But! They had a good program this year. They also had a lot of seniors and upperclassmen, so I give ’em props for that. They didn’t try to go the one-and-done route, which is pretty popular in college sports these days. What is your favorite example of white suffering? Keith: La La Land losing. There we go. It was amazing. Kenny: And, of course, to lose to Moonlight. It was like thank you, universe. This is exactly what we needed in the Trump era. Especially when Trump won, I’ve never seen so many white liberals have tears. I felt terrible, but it was great!